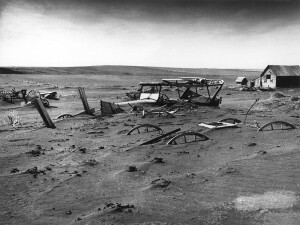 The “Dust Bowl” in the Great Plains, caused by droughts and unsustainable farming practices, leads to thousands of families abandoning their farms in Oklahoma, Kansas, Texas, New Mexico and Colorado. In many regions, more than 75 percent of topsoil was blown away and the drought and erosion affected an area of over 100 million square miles. As part of President Franklin Roosevelt’s New Deal programs, the Soil Erosion Service was established in 1933 (renamed the Soil Conservation Service in 1935) to educate farmers on soil conservation and anti-erosion techniques (crop rotation, strip farming, contour plowing, terracing, etc. ).